Instead of the normal price of £950, the kit will be held at £795 until the 31st March 2017. Innovative yet simple, the Birthing Couch Kit has been exclusively designed for SoftBirth and comes in versatile segments that can be moved around to suit the needs of the moment. The integrated stool pulls out to give comfortable seating for the Midwife or birth partner. The recess created can then be used for the mother to kneel in a supported position. 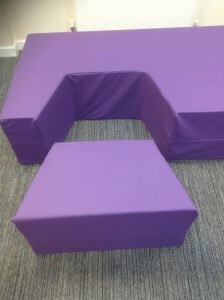 We even include an interlocking kneeling mat for comfort. When fully assembled the couch becomes a comfortable flat surface for mothers to relax with their newborns. For Midwives this gives easy access for exams and suturing without the need for a bed. 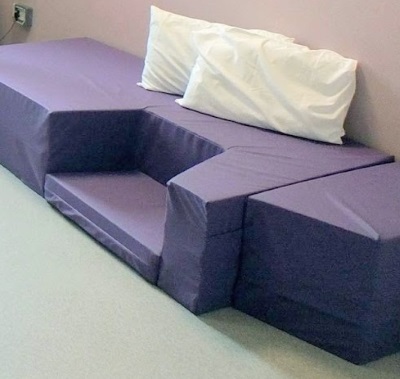 After a design led by midwives and doulas, our Birthing Couch Kit underwent eight weeks of rigorous use in the busy Birth Centre at Darent Valley Hospital, Kent. Here is a summary of the evaluations provided by the Midwives and women who used the Couch Kit. Midwives agreed the couch was easy to clean and disinfect according to current protocols. 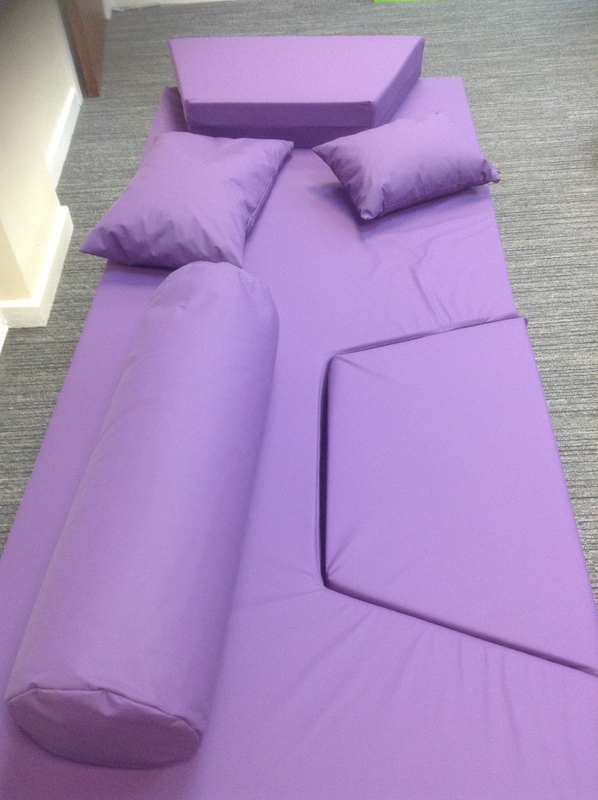 100% of Midwives who have previously used a bradbury birthing couch in their practice agreed that the Softbirth Birthing Couch Kit is a significant improvement on the traditional design. At the end of this trial, rather than return it, the Birth Centre bought it to keep! Since then, other hospitals at Bath, Berkshire, Derby, Powys, Yarmouth…and abroad, have bought birth couches and birthing mats. Softbirth™ have just launched their range of soft furnishings for the birthing room. The most exciting piece being their birthing couch kit. With its simple yet innovative design, its segments can be moved around to suit the needs of the moment. The stool segment pulls out to give a seat for the midwife or birth partner. The recess can be used for the mother to kneel – a kneeling mat is included for comfort. Other couches charge for other items, such as inserts, as an optional extra whereas they are included in the price of the Softbirth couch. The foam used is very firm for safety’ s sake but it is topped off with memory foam to give a very comfortable feel. The comfort is enhanced as the design tries to get away from the ‘clinical look’ whilst still being suitable for the birth room. Its approximate dimensions are 2m x 0.9m x 0.45m. And whilst it is firm and stable, it is not heavy or cumbersome like other similar products. It can be easily moved and deployed or put aside to clear space. 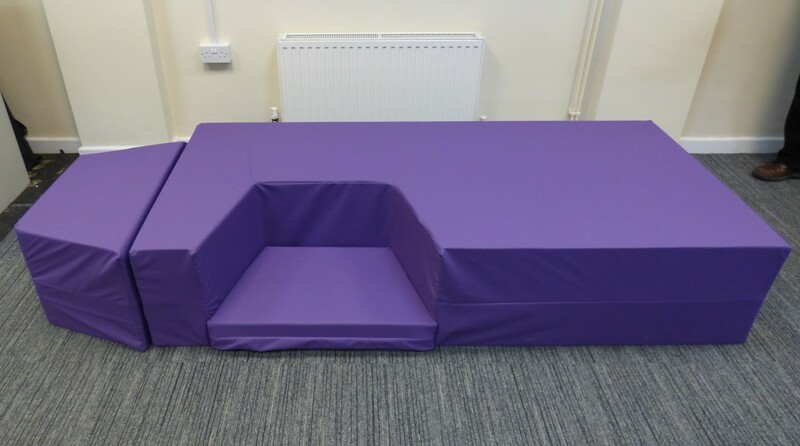 The cover is hospital grade and has welded seams and is fully cleanable. The cover is zipped so that it can be replaced and to enable inspection (the inner of the cloth is white so that any ‘strike-through’ can be quickly spotted. The zips are covered by hygiene flaps. 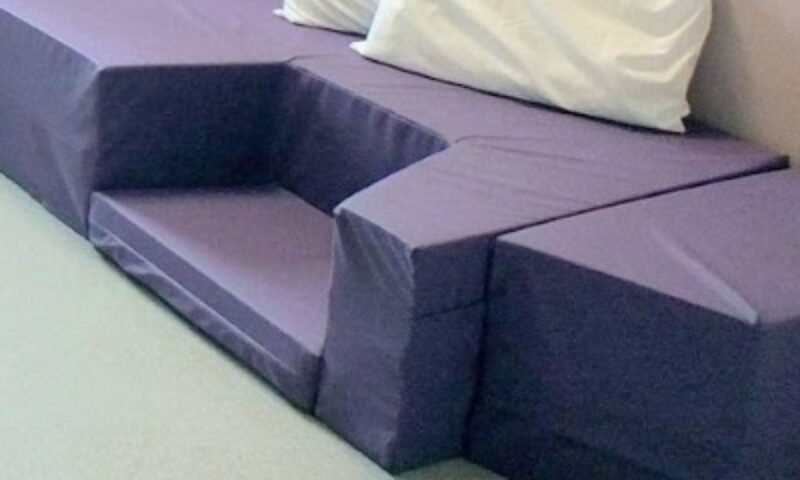 The couch can come in mid-lilac as shown or navy blue and replacement covers can be purchased either with the couch or later as a replacement. Another optional extra is the comfort cushions set consisting of a pillow, a square cushion and a cylinder-cushion. Larger versions of these cushions are available.